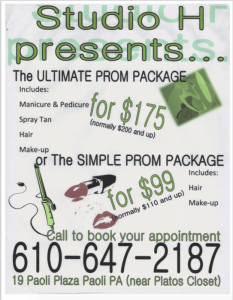 Get Gorgeous for Prom and Save! Get ready for a night to remember with a Studio H Prom Package! All of your prom services will be included in a package deal, so you’ll save cash while making sure you look your best for the big night. Be sure to call ASAP to book your prom appointment. Call Studio H at 610-647-2187 to get started.